1 Tbsp Agave Nectar (plus a little extra for drizzling) Yes, you can use honey instead! Okay, let’s get started. I know everybody is hungry. Wild rice takes forever to cook. To save time, I like to cook it ahead, at the beginning of the week, so it will be ready to use. It stores fine in the fridge and/or freezer. Take note I am using 4 cups of wild rice, measured AFTER it’s been cooked! If you cook 4 cups of dried wild rice for this recipe, you will have a ton of rice coming out of your yin yang! 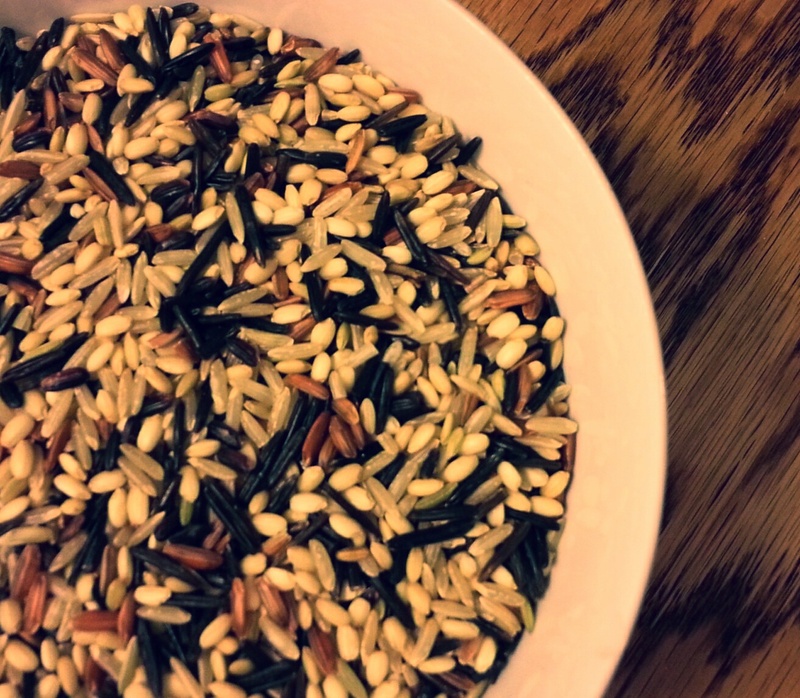 Wild rice in its natural form has a nutty flavor. It’s actually not rice at all but a type of grass seed, which classifies it as GLUTEN FREE. Whoop Whoop! 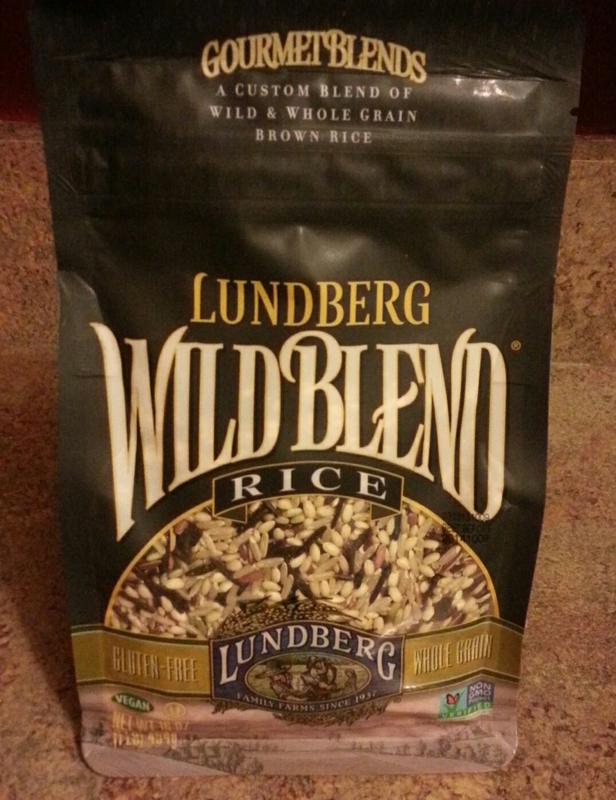 I like to use Lundberg Farms WildBlend rice. Because of its earthy flavor it’s a good idea to use chicken stock instead of water. That way it’s already got some flavor when you’re ready to use it. You’ll just be re-heating it and you don’t want to add a ton of stuff forcing you to stir it into a mushy mess. **If you plan on using chicken stock to cook your rice for this recipe, USE HALF of the amount of Braggs Liquid Amino or soy sauce. ** Alright. I think we have the wild rice under control. The rest is pretty easy. Begin with a Tbsp of olive oil in your pan or wok on medium heat. 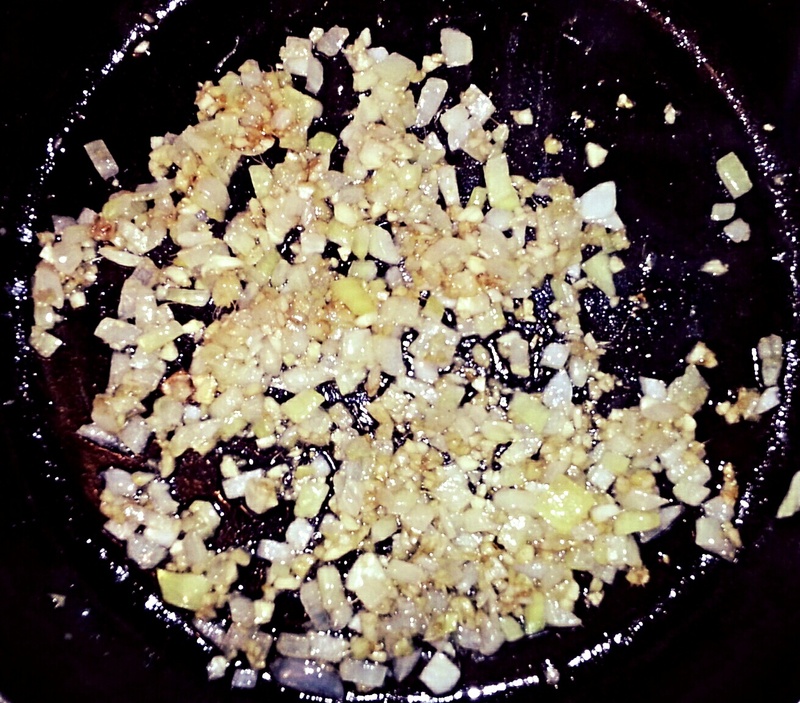 Saute the onions, ginger and garlic until they are nice and tender, about 15 minutes or so. You’re almost done! 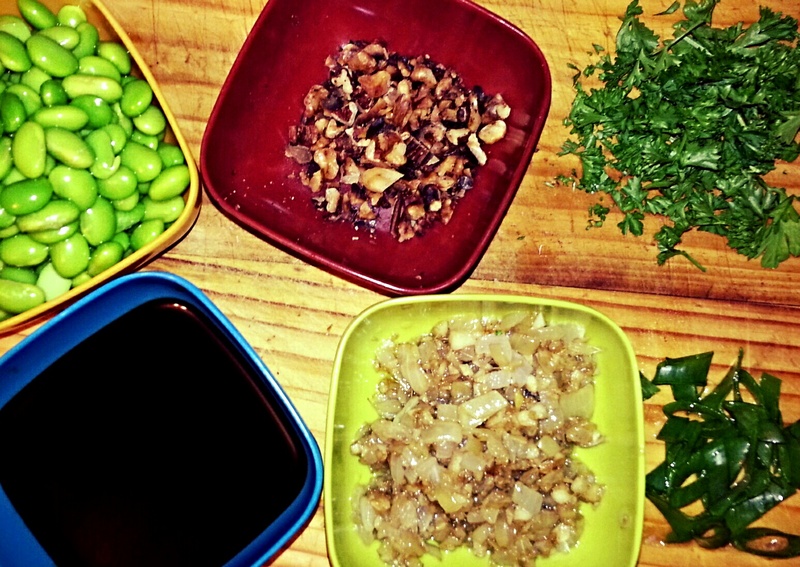 Gather the rest of your ingredients where you can easily grab them. You’re about to get movin’. It should look something like this. Get your pan ready by wiping it out once again with a damp cloth. Another Tbsp of olive oil goes in and heat on med-high. 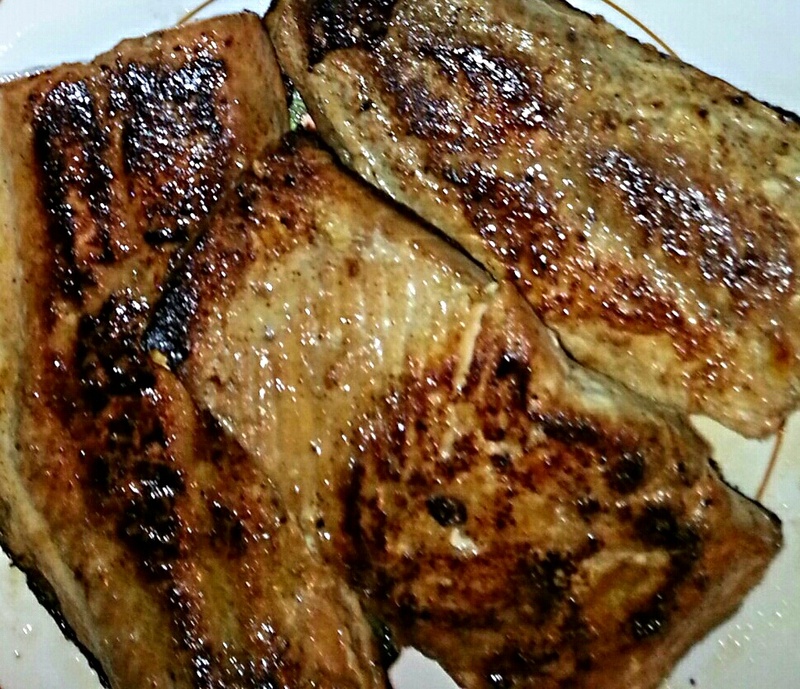 Throw in the edemames, parsley, onion, garlic and ginger mix, a little cracked black pepper and the Braggs or soy sauce. It should heat through in less than a minute. Gently fold in the cooked wild rice then remove from heat. The salmon should still be warm. Flake apart, into big chunks, using a fork or your CLEAN hands. Lightly fold the chunks of salmon back into the pan with the rice. The last step is THE MOST IMPORTANT of them all. Taste it. Drizzle with a little agave nectar, sprinkle on the toasted pecans, which perfectly compliments the wild rice, and top with some sliced green onion. You’re all done! You made it! That wasn’t so bad was it? Now go eat! This entry was posted in Dinner, Recipes and tagged Edamames, Fish, Fried Rice, Gluten Free, Healthy, Salmon, Whole Grain, Wild Rice. Bookmark the permalink. Ashley brought a sample over for a taste. It was delicious.